Middle-school students in a historically black neighborhood near Duke’s campus are digging into the community’s roots in a summer enrichment program sponsored by Duke’s Office of Durham and Regional Affairs. Trudi Abel, a professor in Duke’s history department, and Casey Dunn, a Duke undergraduate, are helping the 11 seventh- and eighth- graders from Carter Community School’s summer program on the Walltown Neighborhood History Project. (WNHP). Walltown, a small neighborhood north of East Campus, was established in the late 1800s by George Wall, an African-American staff member of Trinity College (now Duke University) who relocated to Durham after the college’s move from Randolph County. 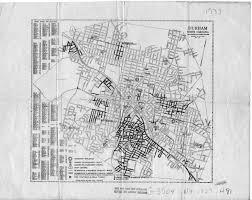 “There is a wealth of information available about middle class African-Americans living in Hayti [a famed Durham neighborhood] during the 1930s, particularly on the Fayetteville Street corridor, but there isn’t as much available for Walltown (West Durham) and its African-American working class residents,” Abel said. The program, which lasts five weeks, is a part of DukeEngage Durham, which connects Duke undergraduates with immersive service projects.